Tommy Adderley was born in Birmingham, England, in 1940. Singing was a big part of his life from infancy. His family sung at pubs and at home. He joined the British Merchant Navy in 1957 and formed a group and performed at sea on his ship, the Dominion Monarch. He made his first visit to New Zealand in 1957 as a sailor. During layovers in New Zealand ports he performed to standing ovations in local clubs like the Trades Hall on Vivian Street in Wellington. Getting a taste for the music biz, Adderley jumped ship in Australia and returned to New Zealand to pursue a music career. He wore fancy suits and wore pointed Winklepicker shoes. He ended up on several TV show appearances in New Zealand starting in 1963. He also appeared on a TV commercial promoting the benefits of eating locally grown New Zealand apples. In 1964 he recorded a cover of the 1961 Ann Margaret single, “I Just Don’t Understand“. Ann Margret’s version had stalled at #31 on CFUN in Vancouver in July ’61. 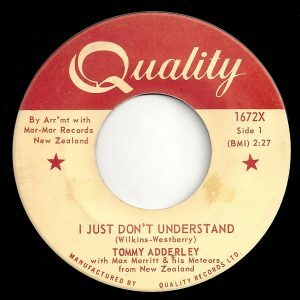 Tommy Adderley’s “I Just Don’t Understand” charted in Australia, New Zealand, the USA and Canada. The Adderley version, backed by Max Merritt & His Meteors, featured a kazoo. when you’re holding my hand. like an ocean needs sand. and you’re holding my hand. The lyrics concerned a “one-sided love” where one person is hurt and mistreated by the other. At the same time, the partner also calls them baby, holds their hand and offers lines like “I need you like the ocean needs the sand.” This is very confusing for the person being mistreated. They feel like they are being pulled toward their lover by affectionate language, only to be pushed away by rejecting behavior. In a Huffington Post article in 2015 titled “Push-Pull Dynamic of a Romantic Relationship with a Narcissist,” Andrea Schneider reflects on what to look out for. She begins her article with this anonymous quote: “A mistake that is repeated more than once is a decision.” Schneider describes Narcissistic Personality Disorder (NPD) where a person’s history has made it difficult for them to have a fear of intimacy. As an adult, the person with NPD gets very anxious when confronted with the possibility of a romantic attachment. When the romantic partner tries to get close to the person with NPD, the narcissist cancels last minute plans, and does other things to push away the person they are dating or in a live-in relationship with. This causes their partner to feel very confused by the push-pull relationship dynamics. Once the ideal partner comes along the person with NPD will find it very hard to sustain authenticity, compromise, empathy, honesty, integrity and reciprocity. The narcissistic person will find some way to sabotage the relationship and secure their own abandonment either by fleeing the relationship or driving the other person away. “I Just Don’t Understand” was released on Viking Records in New Zealand and Australia. They gave the license to Chess Records in the USA, where it climbed to #81 on the Cashbox Magazine singles chart. It also was released on Quality Records in Canada. This resulted in legal wrangling over who had the right to press more copies of the single. When the dispute was not resolved, due to no further copies of the single being pressed, the song fell off the charts. “I Just Don’t Understand” climbed to #4 in Vancouver (BC), #19 in Calgary (AB), #21 in Winnipeg (MB) and Chicago. But, due to the unresolved legal dispute, the song was of little interest in radio markets once word got out that the single was not available for purchase. “I Just Don’t Understand” was co-written by Kent Westberry and Marijohn Wilkin. Westbury was a rockabilly singer who wrote over dozens of songs recorded mostly by country and western recording artists between 1959 and 1988. Among the stars who recorded songs Westbury wrote were Billy Grammar, Bobby Helms and Mel Tillis. The other songwriter was Marijohn Wilkin. Born in Nashville in 1920, she wrote several songs for Stonewall Jackson, including hit crossover country hit, “Waterloo”, and “Igmoo“. Other recording artists who sang her songs were Webb Pierce, Don Gibson and Jimmy Dean. Nonetheless, the single did make money for someone. Tommy Adderley tried to get Viking Records to pay him royalties as he had a hit overseas. However, he got the runaround and then Viking Records folded. Meanwhile, Adderley performed in concert at the Founders Theatre in Hamilton, New Zealand, opening for the Kinks, Manfred Mann & the Honeycombs in 1965. This was part of a tour across New Zealand and Australia. In 1965, Adderley issued a couple of singles, “I Am”, a jazz ballad, and “Mr. Jinx”, a rock and roll number. 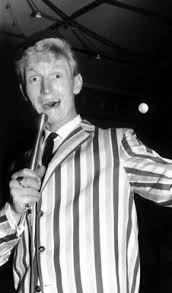 Later that year he had another road tour, this time with Sandie Shaw and The Pretty Things. In 1966, Adderley released an EP titled Two Sides of Tommy Adderley. The EP had four tracks including his covers of “The Girl From Ipanema” by Stan Getz and Astrud Gilberto, “It’s Not Unusual” by Tom Jones and The Righteous Brothers hit, “You’ve Lost that Lovin’ Feeling”. Adderley was frequently performing to raise money for charities in telethons, like the Carrington Psychiatric Hospital. He had a fan club newsletter called Tommy. He also had a six-month gig in Sydney, Australia, and appeared on the TV shows Be My Guest and It’s All Happening. From 1971 to 1974, Adderly was co-owner of a club in Auckland’s Durham Lane. At first it was named The Bo-Peep Club. He closed it for renovations and reopened it under the name of Granny’s. In both incarnations, it was a members only private club. New Zealand had only recently relaxed their laws where clubs had to close at 6 p.m. Granny’s had a full menu and was unlicensed. However, patrons could buy alcohol from the trunk of a car (or car boot) down Durham Lane. The club attracted musicians on tour from overseas including Led Zeppelin, Elton John, Joe Cocker, The Temptations, Three Dog Night and Electric Light Orchestra. The police were not pleased with patrons bringing in alcohol to the club. Raids on the club and licensing fines caused the club to close after three years. In 1975, Adderley did a concert at the Paremoremo prison in Auckland. In 1979, Adderley was arrested for possession of heroin and went to jail for two years. Once he was released from jail Adderley launched the first Auckland Jazz and Blues Festival. He performed off and on over the following years. He died in between sets at a club in Auckland on February 5, 1993. He was 52. Mintrom, Christine. Tommy Adderley (1940-1993): The Man and his Contributions to Pop, Jazz and Rock Music in New Zealand. iUniverse, Lincoln, Nebraska, 2003. Tommy Adderley – Whole Lotta Shakin’ Going On, Dubdotdash.blogspot.ca, April 9, 2014. History of Bluestone Room, The Bluestone Room.co.nz. Songs Written by Marijohn Wilkin, Musicvf.com. Rowe, Michael. Chicago Blues: The City and the Music. De Capo Press, London, 1975. Andrea Schneider, “Push-Pull Dynamic of a Romantic Relationship with a Narcissist,” Huffington Post, October 6, 2015.